Two rooms are reserved for guests, a double and a twin. Beds are always made with crisp, white cotton sheets and breakfast is served at a time to suit you. The Double room with en-suite bathroom has a wonderful, southerly outlook over the lake through the almost floor-to-ceiling sash window; it is a very large, light room with the original shutters and fireplace. 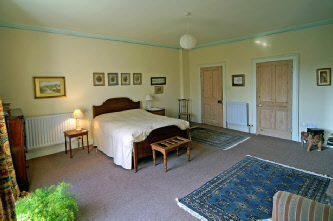 The Twin room has a private bathroom and looks out over the lawns and countryside to the west of the house. This is a smaller, cosy room, originally one of the maids bedrooms. £50 per person - including breakfast and, should you wish, tea on arrival.